Staging pressure ulcers can be challenging. Below are some common questions—and answers—about staging. Q. If a pressure ulcer heals (completely epithelialized over), but later reopens at the same site, how should it be staged? Q. Can pressure ulcer staging be used for venous ulcers? Q. If a wound first presents as a suspected deep-tissue injury (SDTI) and then becomes open, should I chart it as a healing SDTI or restage it as it presents? A. Staging is based on the deepest level of tissue destruction through the layers of skin; therefore, you stage according to what level of destruction you see and/or feel. So, as the ulcer changes characteristics, you should restage it based upon what you see. Remember to refer back to the definitions for each stage, and if you can’t tell what you are looking at, document the wound as unstageable. Q. Once a pressure ulcer is debrided, does it become a surgical wound and no longer need staging? Q. What would be the new stage for a Stage II pressure ulcer that develops slough? A. Because staging is based on the deepest level of tissue destruction through the layers of skin, you would stage the ulcer according to the level of destruction you see and/or feel. If the Stage II ulcer is covered in slough to the extent you can’t see or palpate the deepest level of tissue destruction, it would be considered unstageable. How-ever, if there is scattered, superficial slough and the deepest level of tissue destruction can be seen or palpated, then the ulcer would be either a Stage III or Stage IV. Q. If a Stage IV pressure ulcer is repaired with a surgical flap, would it still be a Stage IV or would it be unstageable? Q. Can a wound have two stages? My patient has a Stage III pressure ulcer, but I also see dark purple around part of it. Should I document it as Stage III with suspected deep-tissue injury? A. A wound can’t have two stages. The entire pressure ulcer should be staged based upon the deepest level of tissue destruction in the ulcer, so in this case the wound would be considered Stage III. A Stage III depth is deeper than a suspected deep-tissue injury. Q. I know that friction and shearing contribute to pressure ulcer development but when do I stage it? For example, a patient’s elbow has rubbed across the surface of the bed, resulting in missing epidermis. Is this now an abrasion or a Stage II pressure ulcer? A. The situation you describe would be an abrasion. Q. Can a patient have a friction wound without pressure? Q. Can a patient have a shearing wound without pressure? Q. A patient’s waistband dug into his side and caused skin breakdown. Is this considered a pressure ulcer? A. Yes. Pressure along with friction from the constriction of the waistband is most likely the cause of the skin breakdown, and this would be considered a pressure ulcer. Q. A patient has a cast or device removed and there is skin breakdown underneath. Is this a pressure ulcer? A. Yes, this would be considered a pressure ulcer and would need to be staged according to depth of the tissue destruction. Q. My patient has a pressure ulcer that is 100% filled with slough, and I’ve determined it’s unstageable. In addition to documenting length and width, should I also try to determine a depth? Can you technically have a depth that is 0.1 cm? Keep in mind that if a wound is open, it will have depth, because at least the epidermis has been penetrated. The epidermis has a thickness of 0.1 to 0.6 mm, and the dermis thickness can range from 2 to 4 mm. • National Pressure Ulcer Advisory Panel. 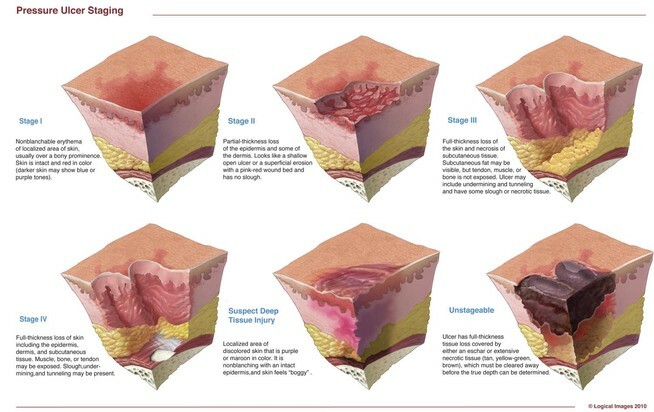 NPUAP pressure ulcer stages/categories. • Pressure ulcer staging test. Practice your skills. 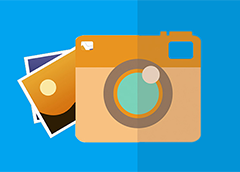 uploads/2012/01/Reverse-Staging-Position-Statement%E2%80%A8.pdf. Accessed November 1, 2012. 2. National Pressure Ulcer Advisory Panel and European Pressure Ulcer Advisory Panel. Prevention and treatment of pressure ulcers: clinical practice guideline. Washington, DC: National Pressure Ulcer Advisory Panel; 2009.
doc/OASIS-C_ItemGuidance.pdf. Accessed November 1, 2012. 4. Centers for Medicare & Medicaid Services. RAI Version 3.0 Manual. Section M. October 2011. 5. International Review. Pressure ulcer prevention: pressure, shear, friction and microclimate in context. A consensus document. London: Wounds International; 2010. 6. Hanson D, Langemo DK, Anderson J, Thompson P, Hunter S. Friction and shear considerations in pressure ulcer development. Adv Skin Wound Care. 2010 Jan;23(1):21-4. 7. Hess CT. Clinical Guide to Skin and Wound Care. 7th ed. Philadelphia, PA: Lippincott Williams & Wilkins; 2012;chap 2. According to the MDS 3.0 RAI manual, If a current pressure ulcer worsens to a higher stage during a hospitalization, it is coded at the higher stage upon reentry and should be coded as “present on admission” or hospital acquired. If a patient enters an Ltac with pressure ulcer scars and while in the Ltac the scars reopen,is this considered a new hospital acquired or a deterioration of a wound? I am not familiar with the most current regulations for LTAC’s, however, I recommend checking with either your facility policies or LTAC guidelines for the answer. 1) Is there granulation on stage II pressure ulcer? 2) Pateint has DTI on R heel and is positive for DVT after doppler study… is that a pressure ulcer or venous ulcer? If a pressure ulcer develops granulated tissue in the center, resulting in the division of the ulcer in two, should it be counted as two different ulcers, or it still being counted as the same ulcer? In reference to the last question, isnt slough dead subcutaneous tissue? If so that would not be present in a partial thickness wound, would it? if there is slough wouldn’t that automatically make the wound full thickness? A PATIENT CAME TO OUR FACILITY WITH STAGE 4 DECUB ON SACRUM EXTENDING TO R AND L BUTTOCKS,AFTER 4 -5 MONTHS THEY WERE ALL HEALED,ALL DECUB HEALED IN FEB OF 2013 FAMILY WAS SO HAPPY,THERE WAS A PRESSURE REDUCING DEVICE IN PLACE ,SKIN CHECK WEEKLY,CNA CHECK ON SHOWER DAYS ALL LOGGED,TURNED AS FREQUENTLY AS POSSIBLE, THIS PATIENT IS TOTAL CARE WITH CONTRACTURES IN ALL EXTREMITIES CONNECTED TO A VENTILATOR,LAST SEPT. WE HAD A SURVEY,ONE OF THE SURVEYOR FOUND A 0.4-0.5CM OPEN WHERE THE OLD SCARRING OF THE PREVIOUS HEALED STAGE 4,APPEARED JUST HAPPENED AT THAT TIME,TX NURSE WAS VERY SURE IT WAS NOT THERE THE DAY BEFORE,THE SURVEYOR CHECKED AROUND 10AM,NO WT LOSS,PT HYDRATED ON GT.,DX ANEMIA,CKD.IS IT CONSIDER UNAVOIDABLE?IF SO WHAT APPROPRIATE GRADE IN TERMS OF THE SCOPE OF SEVERITY. If resident comes into facility with a stage II that she has had at home for years, we heal it in facility and after about a month it re-opens, is that a facility acquired or community? Is there a time frame for it to be still the community acquired verses facility? You probably will not like this answer but once the pressure ulcer is healed and then reopens while living in the facility, it would be considered a facility acquired pressure ulcer. Definition of a healed pressure ulcer according to CMS RAI Manual for Long Term care: Completely closed, fully epithelialized, covered completely with epithelial tissue, or resurfaced with new skin, even if the area continues to have some surface discoloration. Hi. I am new to a LTC facility and need to know where I can find some of the state and CMS guidelines for these types of facilities, regarding wound care and required documentation. Is it different from the hospital setting? That’s what I have observed so far, but want to make sure I’m doing the right thing. Documentation guidelines vary based upon care settings and governing bodies. Below are some links to different guidelines for Long Term Care. In addition, be sure to check your facility policies for documentation guidelines as some Long Term Care facilities document above and beyond the Federal requirements. Wishing you the best in your new position! 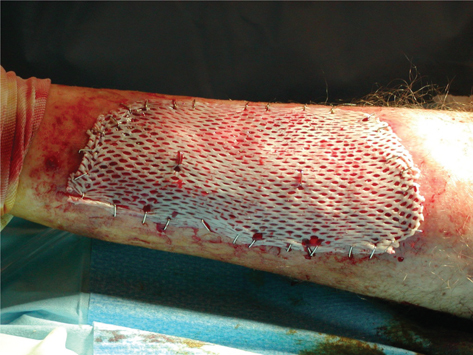 A patient has a pressure ulcer which has part of the wound bed covered with eschar. If the nurse can distinguish some muscle, tendon or bone on the part of the ulcer that IS observable, can it be staged as a stage IV pressure ulcer? Thanks a lot! You are correct. PU staging is based upon the deepest tissue injury/destruction through the layers of the skin either visible or directly palpable. The deepest a pressure ulcer will be is when there is visible: bone, tendon/ligament or muscle, which is a Stage IV. if a patient has a stage 1 to heel and it has not healed for over 2 month, despite treatment and pressure off loading, now has a more purple like discolor, can we stage it as a SDTI? If the area meets the following description then it should be staged as an sDTI. “Purple or maroon localized area of discolored intact skin or blood-filled blister due to damage of underlying soft tissue from pressure and/or shear. The area may be preceded by tissue that is painful, firm, mushy, boggy, warmer or cooler as compared to adjacent tissue. If a patient has a documented abrasion to the left hip, but a wound care doctor is performing surgical debridement would it be classified as an abrasion or now a surgical wound? Debridement is a treatment procedure applied to the abrasion, so therefore it remains an abrasion. Another thought, if the abrasion has developed slough & necrotic tissue related to pressure, then it should be reclassified and staged as a pressure ulcer. It would still be considered a Stage IV, even though slough has covered it, giving it the appearance of unstageable. The category of unstageable was developed to represent a pressure ulcer that the true depth is unknown because the base is covered and muscle bone or tendon are not seen or palpable. However since the true depth is known, in this case, it can not get any worse than a Stage IV and can not be downstaged to a stage III. As the saying goes, once a stage IV, always a stage IV. The question: “A patient’s waistband dug into his side and caused skin breakdown. Is this considered a pressure ulcer?” has an incorrect answer. This would not be considered a pressure ulcer. A pressure ulcer is localized injury to the skin and/or underlying tissue usually over a bony prominence, as a result of pressure, or pressure in combination with shear. This is an abrasion, not a pressure ulcer. If you have a med/surg pt come to your hospital with a stage I wound and then gets worse would you restage the wound. Example went from a stageI to a stageII and treatment was changed to relfect the new wound. The only time that you don’t restage is if the wound was a stage IV and starts healing you wouldn’t chart it as a stage III? How long does it take for a blanching buttock to worsen to stage III or necrotic? If a wound that is unstageable is eventually debrided of eschar, does it continue to be unstageable or can it now be staged to current status? I would like to clarify something please. I am an MDS nurse at a LTC/Rehab facility. We had a patient admitted with a large unstageable pressure ulcer with slough according to our wound nurse. In 14 days she is now stating that it healed in the center and now there are three pressure ulcers (2 with slough and 1 with epitherlial). Am I correct to think it should still be the unstageable that it started with but make a note that it is healing? Is it correct to say that it is healing with slough under it? We have been having trouble with our wound nurse documentations and I dont think she is using any resource to help with questions because she answers with “I think”. Thank you for your help. If a pressure injury completely heals, should the parameter/documentation be discontinued? What happens if it reopens? Especially if it was a healed stage 4 pressure injury that is already prone to skin damage due to previous damage? Would that still be considered hospital acquired? Also, could you provide literature that supports what is the standard to documenting on healed pressure injuries?